If you need to talk, Kitsap PFLAG is meeting over coffee on Monday in Bremerton. Monday June 20th, 6:30 pm, at the Hot Java Cafe in Bremerton at the corner of 4th and Pacific. We will be talking about how the events in Orlando have profoundly affected us, and we will get some information about I-1515 and the Washington Won't Discriminate group organizing against its passage. 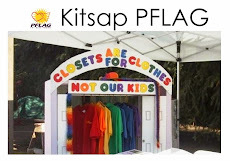 If you want to get involved in Kitsap PFLAG there are a few ways you can help. Most importantly, come to our meeting! We hold a monthly conversation and often it's just a few of us who enjoy talking to each other and we gab over coffee for a while. And that's great. And you shouldn't be afraid to join us! But, the power of a group like PFLAG is in providing a caring ear for those who find themselves in need of support. We've had people drive for hours to come to one of our meetings. Being present to help others is one of the most important ways to be a part of PFLAG. Sometimes you need help yourself, but sometimes you're simply there for others. Kitsap PFLAG also volunteers at a number of area events. But we could do more! We'd love to be more visible in the community to show that there are families here who love and support LGBTQ people. Upcoming, we are going to have a booth at Kitsap Pride on July 16. We need volunteers to staff our booth for an hour or two to let others know about PFLAG. Let parents know they have somewhere to talk. Let youth see that family acceptance is possible. And, we are going to be marching in the Bainbridge Fourth of July parade on, yes, July 4th in Winslow. We walk with Kitsap Pride and it is just a blast. We wear rainbows and hand out Starburst. The crowd loves to see us. We've had every age march with us from kids in strollers to elders in wheel chairs.